Back in Acebo there are 3 albergues, 1 of which has a café/restaurant and another has a kitchen. There is a small shop down the main street where you can get supplies. There are also a couple of hostals in the village if the albergues are full. 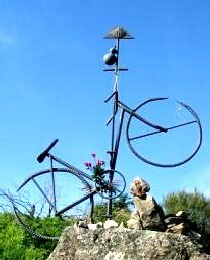 As you leave El Acebo you pass the local cemetery where you will see a sculpture of a bicycle. This was placed here in memory of a German pilgrim named Heinrich Krause, who sadly died in 1987 of a heart attack at the age of 70 just outside el Acebo on his way to Santiago. Passing the sculpture keep walking down the path towards Riego de Ambrós. In Riego de Ambrós there is a single albergue, a pension and a hostal. A restaurant in the village offers a pilgrim menu and you can get some food at the café too. Walk all the way through the village descending all the time and follow the track that takes you through a chestnut wood and join the road that leads into the village of Molinaseca. Just as you enter the town, before you cross the bridge, is the 17th century Santuario de Nuestra Señora de las Angustias which has been built partly into the cliff. 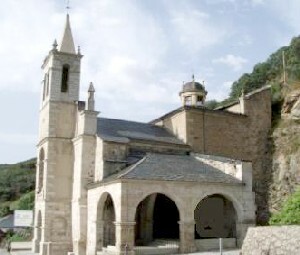 Walk past the Santuario de Nuestra Señora de las Angustias and over the Río Maruelo via the medieval Puente de los Peregrinos. Molinaseca's location has over the centuries attracted the nobility and it is said that Doña Urraca, the 11th century Queen of Castilla y León and Galicia once lived here. Many of the houses in the village are emblazoned with the elaborate coats of arms of the various noble families that once resided here. In terms of its importance regarding the Camino de Santiago it once boasted 4 pilgrim hospitals but nothing remains of these. The Calle Real is the main street through the town and it is here where most of the noble's houses can be found. The street also has a number of channels running down it which were used to clean the streets. These channels led to a new fiesta being devised in the early 1950's, which is now celebrated on the 16th and 17th August every year. In 1954 a couple were celebrating their wedding and some of their guests decided that they wanted to have a bit of fun so they decided to open the sluice gates a little bit, like the villagers did when they wanted to clean the streets. The water came down the channels and the guests started to throw water over each other and great fun was had by all. They repeated this the following year and after a while it became a tradition. The day begins at 3 pm with a wander round the bars of the village followed by a chocolatada, a gathering where hot chocolate is served, at the local school at 8pm. At 9pm the sluice gates are opened and water pours down the channels and then the real fun begins. In terms of accommodation there are a couple of albergues and 4 hostals as well as a number of places where you can stop to eat or to have a drink.